Blease Barn in Threlkeld sleeps 2 people. Blease Barn in Threlkeld is set on the slopes of Blencathra; this property really does enjoy a most impressive location in a tranquil, elevated position with stunning views to St John’s in the Vale, Castle Rock and Clough Head. As the name suggests, the accommodation is an apartment on the first floor of a converted barn, adjoining the main farmhouse. There are many walking opportunities from the doorstep with direct access on to Blencathra and footpaths to Skiddaw and Latrigg. The village of Threlkeld, which has a wonderful coffee shop/theatre/cinema/concert hall, as well as two pubs each serving good food and real ale, are a 10-minute walk along the footpath. Despite the accommodation being on the first floor, the access is via a barn door at ground level to the rear, as the house is built into the slope of Blencathra. Once inside the accommodation is all on one level with an open plan living space with a cosy wood burner, a spacious double bedroom with lots of storage and an en-suite shower room with two wash basins and fantastic views! The vibrant tourist town of Keswick is only 4 miles away and has a wealth of amenities. There is a shop 4 miles, with the pub and restaurant 800 yards from Blease Barn in Threlkeld. Ground Floor: Blease Barn is all on the first floor (with level access). Kitchen area: With electric oven, electric hob, fridge, freezer and washer/dryer. Bedroom: With double bed and en-suite with shower cubicle, bidet, toilet and heated towel rail. First Floor: All on the first floor (with level access). 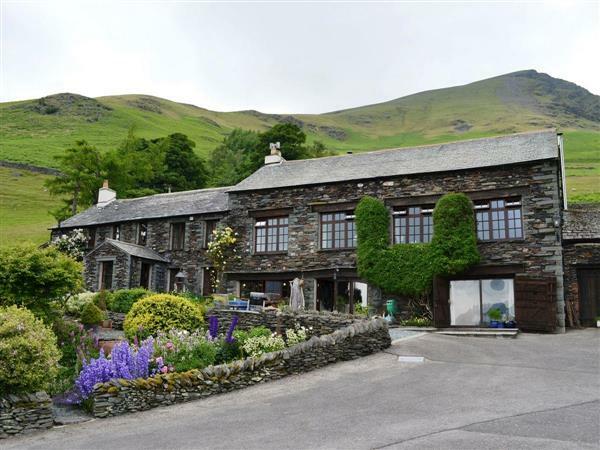 Oil central heating, electricity, bed linen and Wi-Fi included at Blease Barn in Threlkeld. Towel hire. Initial logs for wood burner included. Small lawned garden with decking and garden furniture. Private parking for 2 cars. No smoking. Please note: The property has a natural water supply and there is an unfenced drop adjacent to the entrance. Holidays at Blease Barn run from Friday to Friday. For a better idea of where Blease Barn is, you can see Blease Barn on the map below. Blease Barn is in Cumbria; should you be on the lookout for a special offer, you can find all the special offers in Cumbria. It's always worth checking to see what is on offer at the moment. Do you want to holiday near Blease Barn (UK1063), you can see other cottages within 25 miles of Blease Barn; have a look to find your perfect holiday location.